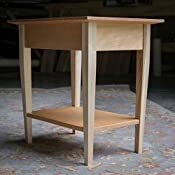 This handcrafted solid hardwood table is versatile and works equally well as a side or end table, or as a nightstand. 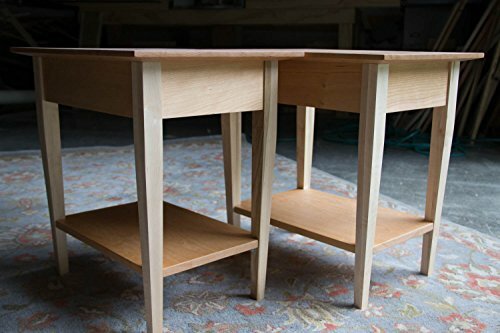 The pair of tables pictured has a cherry top, rails and shelf, with maple legs. Each table is custom made to order, and we can make them in any combination of our American hardwoods: ash, maple, curly maple, ambrosia maple, red oak, white oak, quarter-sawn white oak, cherry or walnut. The dimensions of the top are 16" x 22" and it has an undercut beveled edge. The table's height is 22", and we are happy to make it whatever size you need- just send us a message. The legs are tapered on the outer edge and are detachable for ease of shipping, and very easy to put on. The shelf is resting on shelf clips, and is removable. We can add a drawer to this table for an additional fee. The table is finished in a hand-rubbed 0% VOC linseed oil.